Modern and Trendy Design - InstaNatural's Essential Oil Diffuser is the perfect aromatherapy companion to any living space. Its trendy and modern European design, along with its soft blue LED illumination, adds flair to make your home or office look more contemporary, while still adding the full-fledged functionality as a diffuser. Easy to Use - This noise-free diffuser features simple and safe operation as well as easy cleaning and high efficacy. Simply fill the reservoir with 30-100ml of water, add 3-5 drops of your favorite essential oil, and press the power button to instantly start enjoying the cooling mists for a more comfortable and aromatic environment. Long Lasting Use - At full capacity, the Essential Oil Diffuser delivers 4-5 hours of an aromatic experience. 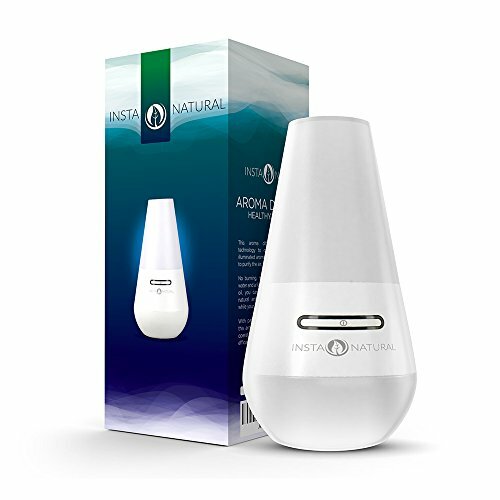 You can use this aromatherapy humidifier with citrus oils without any problems. It's also perfect for your bedroom, living room, bathroom, office, reception center, hotel, beauty salon, workout room or any small or large living area. Specs - 100ml water tank capacity; 250 sq. ft. of coverage; DC 24V Voltage; 12W Power. Comes with accompanying adaptor. 100% BPA Free. Essential Oils NOT included. Chapel Bells Wind Chimes. Porch or Outdoors. Tuned to Resemble Resonant Chapel Bells.